Almost an year ago, my life took a pleasant, awesome turn. I became dad to two beautiful, naughty and energetic kids. We named them Nishanth & Nakshatra (meaning Moon & Star). Ever since they entered our world, our lives have changed. They bring laughter, love, anxiety and curiosity to our life everyday. And this Friday (24th Sept), they will be one year old. 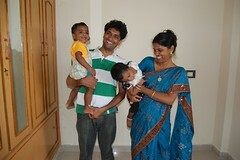 To mark the occasion, we are having a mild extravaganza at our home in Vizag, India (here). I would be very happy if you can join us and bless our babies on this occasion. If you are planning to come, just drop me an email at chandoo.d @ gmail.com and I will email you address and details. Chandoo, thank you for the kind invitation. I wish a special birthday day for your daughters, Nishanth & Nakshatra. Will you be serving "dudh pakh"? What a kind thought to invite us! I pray your family will be continually blessed. Thank you very much for the invitation, how I wish Philippines is just a Jeepney ride away from India. Best wishes for your baby girls and more blessings to come. Thanks for the invitation ! You treat everyone that comes to your site as part of your family community. Me and my family wishes Nishanth & Nakshatra a very very happy birthday !! Though physically we cant be with you to celebrate the occasion, you know our blessing are with you ! To be a father is not easy, furthermore you have to be a father to 2 kids ! Dad of 2 and 9 year old. It was very kind of you to invite us all along to the 'Extravaganza'. Like others that have commented here I too, am to far (Australia) to pop over for a piece of cake 🙂 Best wishes to you and your family on such a milestone. God bless Nishanth & Nakshatra. Wishing you and your family a very enjoyable first birthday party. God bless the little ones. Have a blast. Indeed children are a blessing and make our lives much more deeper. Wow! I wonder how that would look; all those Excel users partying with your cute kids! Enjoy the festivities and remember; they grow up really fast. Please accept my wishes for Nishanth & Nakshatra, and a very very happy birthday to both of them. Thanks for the invitation. Wishing Nishanth and Nakshatra a very happy birthday and God bless all of you! Your kids look adorable. Congratulations. My Aashirwaadam to both of them. Wish you and your entire family all the blessings. May god provide your babies with all the love and charm in the entire universe. Like Emma I am rather far away (South Africa), but best wishes to you and your family on this special occasion. 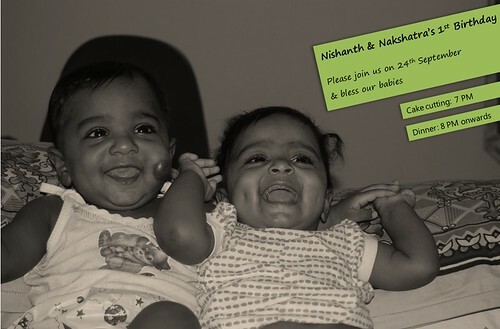 Wishing Nishanth and Nakshatra a very happy first birthday. My youngest has just turned 18, and I wish you and your family every happiness in the exciting journey ahead. I'm reading your blog for more than a year now, and i'm very pleased by this invitation. I wish a very special Happy Birthday to the 2 little ones from Mauritius Island. If, for any reason, you are coming on the island in the future, feel free to drop me a mail. Have a nice party, and a nice year to come with Nishanth and Nakshatra. This year is not possible for us to attend. My family will be there for your next family party. May God Bless your little ones with Good Health… Happy birthday to them from me....I am also the father my little daughter named akanksha, she is 2.5 yrs old,,,,but i am unemployed 2 yrs ,,i know when u become a dad u r many hopes. @all.. thanks for the wishes and blessings. We had a fantastic weekend with all the relatives, friends. Kids loved the cake, enjoyed the beach and had fun playing with gifts. Here are some photos..
Chandoo & family - greetings from Ireland, hope you enjoyed the day!